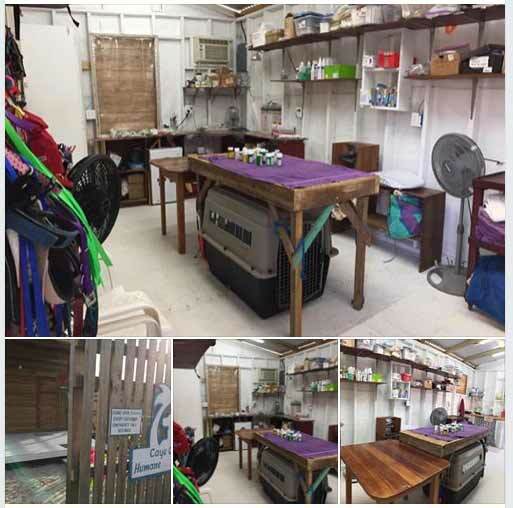 Register Log In AmbergrisCaye.com Home Forums Caye Caulker Caye Caulker Humane Society has a new clinic! The CCHS has a new clinic, starting this coming Saturday, 13 October, weekly and special surgery clinics will be held in our beautiful new building at our convenient new location near the Alamina cemetery. Same time: 9 - 11. Come see us! What you may not know is that clinic was literally built while all Board Members and were out of town. But because the Humane Society has amazing volunteers, the clinic was built and not a single Saturday clinic was missed. *Plus*, a spay/ neuter day got fit in just days before clinic locations were moved! That's incredible! Huge thanks are in order for the faithful volunteers who kept things moving seamlessly (or better) while the Board was out of town: Susan Pelt, Alex Sidie, Shaena Levin, Susan Newhouse, Staci Coberly, Joshuan Gonzalez, Carol Koris, Jax Lancio, Johanna Starck and Ellis. Also a bit thank you to Merlin for sewing some curtains for us!! Please meet our beautiful new clinic! This building truly was a labour of love on the part of many people! Thanks are in order for Susan Pelt for her excellent work at being our building goddess and forewoman and overseeing the construction of the building while most of our volunteers were out of town; Carol Koris for being painter and general helper extraordinaire; Cher Mungovan for supply transport and needle sorting, Tom Sullivan for generously allowing us to build on and use his land; Roberto Cruz, Manager at Weezie's and huge help throughout the process; David Gray doing the electrical wiring for the building, David Waugh for doing the wiring, plumbing and being our Door Wizard); Matt Bamford for making our cupboards and Matt and Keith Tzac for putting in window inserts allowing us to attach screens or plastic covering as needed; Allie Johnstone for painting us great signs; and finally, Frontier Belize volunteers for helping move all our crap and sorting through leashes and collars. Thanks so much to everyone who helped out! We can't wait to start seeing our patients in our swanky new building. Come see us!